On a beautiful clear, sunny but decidedly chilly day, it was rather pleasant to walk over Putney Bridge on the usual ritual pilgrimage along the Thames through Bishop’s Park. Until the conversation turned to our season that is, interestingly, there were some expressing cautious optimism, after all there have been few encouraging improvements in the last games, pity the results haven’t moved in the same direction. The usual conflab with other fellow-sufferers outside the ground echoed my group’s pub and restaurant conversations prior to reaching the Cottage. The topics ranged from speculating whether Slav would have left the team second bottom had he not been outed, how the players that have been purchased were not those the manager requested in the summer recess, to the incompetence of the those running the club, the boss’s son in particular. That last point appears to be universal amongst most I spoke to, we do love a scapegoat we football fans. It was apparent from the whistle that the team had been briefed to take the game to the opposition and we had all the impetus in the first minutes. 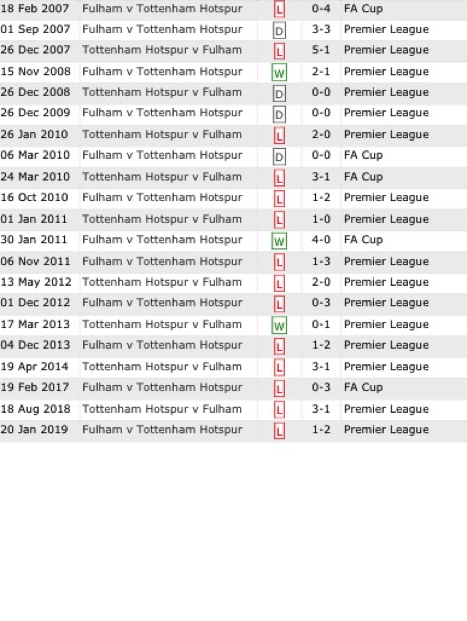 Spurs had Kane, and Son missing for this fixture and maybe that had an effect as it was Spurs who resembled a team at the bottom of the table in the opening exchanges. Christie was making some energetic runs at the Tottenham goal and we began to stroke the ball about imaginatively. Spurs had a chance when Eriksen came close with a medium range effort, the game entertainingly toed and froed. Babel was in the thick of it early on and was close to opening the scoring on the 12th minute but his effort was struck straight at a grateful Lloris. The determination and application shown by the Fulham boys was infectious and we harried, pushed, marked and energetically bossed proceedings. Babel and Mitrovic were giving the Spurs defence a proper testing and Sanchez, in particular, was fortunate to not pick up bookings as the over-myopic ref Pawson, weirdly seemed intent to let Spurs get away with the most sneaky and blatant things. Having said that Mitro does grapple all the time and I guess that referees have him on their Blacklist. Our aggressive tactics paid off when in the 18th minute following a seri corner, the ball whizzed in seemingly to connect with a stooping Tim Ream’s forehead, it missed and flew in off the Spurs striker Llorente, ironic considering the Burnley debacle. It is worth mentioning that the corner was earned by more excellent wing play from our right back Cyrus Christie. Typically, Fulham, having taken a deserved lead, reverted to type and overlooked the tight and aggressive tactics, instead dropping deeper and gifting Tottenham much more possession. This fortunately came to nothing damaging for us and as the first half entered it’s final five minutes, Babel met a great cross from a rampaging right-wing Christie foray, sadly it was hopelessly high and wide. Ryan Babel was once again instrumental in driving at Spurs, powerfully penetrating the Spurs right wing and delivering a superb cross to Schürrle who controlled the ball and volleyed brilliantly, straight at the keeper who found the attempt too hot to handle and parried it to an offside Mitro who banged it into the net, the lino duly flagged the attempt illegal. The half ended with Fulham’s lead intact, giving us plenty to discuss during he interval, this had been an enjoyable contest and Fulham’s performance just what the doctor ordered. The second half soon answered the question on all of our minds, we allowed Spurs too much time, we sat deep, didn’t cover the spaces ad generally seemed distracted which inevitably cost us the equaliser, Eriksen feeding Ali six minutes after the restart, who up until then might just as well have not been on the pitch, naturally he headed their first goal. The game rolled on entertainingly but frustratingly from the home fans’ viewpoint and neither side was able to breach the opposition goalkeeper. Disappointed to not have retained the lead or improved on the one goal we’d scored, the 90 minutes ended with three minutes on the fourth official’s board. Seconds from the final whistle, heartbreak, an undeserved winner from Harry Winks, absolutely disappointing and disheartening, a draw was the least this performance had deserved.